← Will a Neonic Ban Save the Bees? 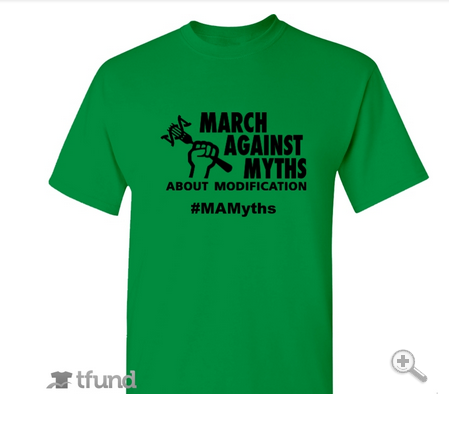 One week ago today, I joined the March Against Myths About Modification. This was the counter initiative to the March Against Monsanto. I had been studying and writing about GMOs for a while and this seemed like a good opportunity to meet people on both sides of the debate and to steer the conversation to agricultural biotechnology as a whole rather than focus simply on one company. Since I became aware of the event in DC only the day before I did not have much time to prepare myself. For one thing, I did not have the green MAMyth shirt but planned to paint my nails green instead. On the day , I was late making my sign so even that touch of green had to be, sadly, foregone. It started off well. Just as I arrived I met the only other person I knew before the event, a scientist and mom who had brought her baby along, then I met in person some one I had long followed on Twitter which was great. The group that had gathered at the Monsanto office was small, there were scientists, writers, students, and a few children with their parents. Every year I would see reports of “tens of thousands” of people at this March so I had the somewhat confused idea of a sea of people just marching by us, perhaps one or two would stop by to talk and we could present some facts and have a fruitful discussion. Maybe they would ignore us altogether which would be boring , but at least I had new friends to chat with. When the marchers came into view, their numbers were decidedly less than the media reports of past years. They stopped in front of us, slogans baring over a loud sound system, and suddenly a few of them rushed out wearing masks, yelling in our faces, screaming at the children in the group and cordoning us off with biohazard tape. The only check to their aggression seemed to be the police woman on a very large but quiet horse, who was watching the proceedings. The core group at the front of the marchers was loud and combative. One guy shouted at me saying I was paid by Monsanto and did I know that Golden Rice had failed. I replied the best as I could in all the noise but he was not interested in my facts on Golden Rice, he then shifted to “what is your heritage?” There was another young man that I and another member of our group spoke to briefly who seemed able to discuss food waste but then had no idea about the Green Revolution. I saw a lot of hate, fear, ignorance, confusion (“Monsanto wants to kill us, they want us to keep buying seeds”,um.. dead people can’t buy anything, the government is out to get us, chemtrails, hemp, all sorts of stuff came up) but no interest in an actual conversation. They knew what they knew and that was it. I can recognize that but the accompanying vitriol was scary. One of the main speakers later went on Twitter threatening our group and asking help in identifying us from photos of the event. Not pleasant at all. All the studies I knew of, the facts on the ground in less fortunate economies, the potential applications for malnutrition, climate resilience that I wanted to share were drowned out in accusations of “shill” and references to youtube videos that supported the narrative of fear. All through this week, I have been reflecting on the lessons from the event. Clearly, a strategy is needed: to those who are marching against every conspiracy they can think of, there is no engagement possible. There were some on the margins, though, who did not seem as dogmatic and next time we could focus on speaking to them. Our presence , though small, was significant as the Marchers realized there are people who believe deeply in the evidence supporting GMOs and are prepared to stand up for it. But to really change perceptions, our efforts needed to be directed elsewhere: at those who are paying extra at the grocery store everyday in the belief that the premium for “organic” or “non-gmo” is worth paying for although the evidence does not support that. The anti -GMO group exhorted their supporters to “vote with their wallet” , our goal would be to follow the money and provide facts to those who spend more from fear. This was not my first march but it was very different from students protesting delayed exam dates! I made new connections and enjoyed learning more from them, but the experience itself was overwhelming and I had to take sometime to reflect. But as I read about other experiences and see the renewed energy among those who are committed to the goal of sustaining a conversation , I am looking forward to participating next year, hopefully with many of my new friends, with an effective strategy, prepared to look past the hate clouds at those who might be open to looking at things differently, and yes, with coordinating nail polish!